WHOA! 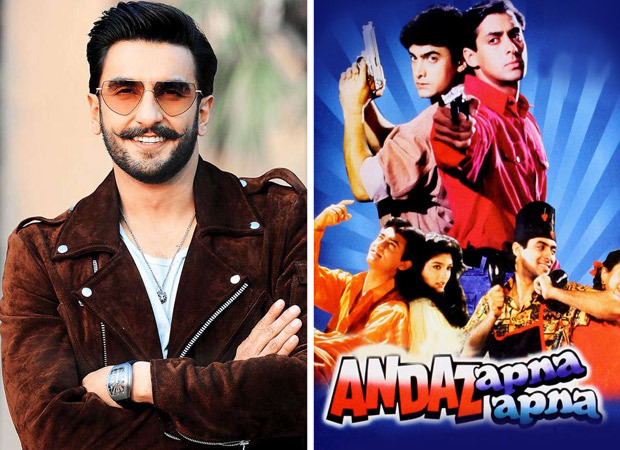 Did Ranveer Singh just CONFIRM Andaz Apna Apna 2? Ranveer Singh is all set to ROAR on screen with Simmba which will be releasing on December 28 and we can’t help but get all excited about this out and out commercial film. This is for the first time that Ranveer has paired up with Rohit Shetty for a feature film and this Jodi is sure fiery! Ranveer has been running from pillar to post promoting the movie and has been raving about working with Rohit and newcomer Sara Ali Khan. As part of promotions, he also spoke to his fans live on Twitter over the weekend and guess what? He made a startling revelation! When a fan asked him about doing an out and out comedy, he replied with jest, “Hoping for something crackling to come along! very much looking forward to something in that space! Andaz Apna Apna 2?! ;)” He seemed pretty pumped up with the idea of doing comedy and even hinted at playing one of the lead in this cult comedy caper. Now, it remains to be known if he is playing Salman Khan or Aamir Khan’s character! But it sure would be interesting to see Ranveer in that space. And if it is left upto his fans then they would surely choose Arjun Kapoor to play the second lead, thanks to their TERRIFIC off screen chemistry. In fact Ranveer also said in the same chat that he would love to work with his BABA Arjun Kapoor who has become ‘too busy for him’. Ranveer has made Simmba priority for now and has put everything else on hold. Even his long-awaited honeymoon. He has mentioned in a recent interview that he deserves a break soon and he will take one after the movie releases! Simmba is set to release on December 28 and has Sara Ali Khan in lead opposite Ranveer. It also has a cameo by Ajay Devgn. Ranveer Chings Returns Poster : Ranveer Singh In A Badass Avatar!